Known for their big, colourful and iconic fridges, SMEG also make a wide range of other kitchen and home appliances. Our range of SMEG toasters take the iconic design associated with the fridge to give you a bold toaster which will look great in any kitchen. 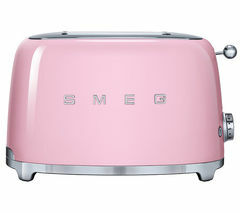 For a colourful kitchen, the red, pink, blue or green SMEG toasters will give you a bold and chic look. For the more conventional colour schemes there are options in cream, black, and chrome. Featuring standard defrost and warming functions, you’ll be able to thaw our frozen bread or keep your toast warm as you boil the kettle. 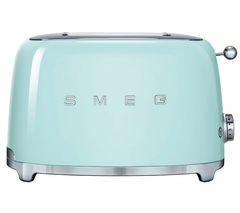 Each SMEG toaster also comes with a bagel function, extra-wide slots to give easy access once your toast is done, and are available in two or four slot models. If the SMEG design isn’t to your taste then take a look at our range of Kenwood toasters, available from under £50 and built with ease of use in mind. The kMix range comes in a variety of colours, and features a high-lift eject, extra-wide slots and your usual defrost, reheat and cancel functions. The Styline range of Bosch toasters comes in a stylish shiny finish, with two bread slots and mirror heating to ensure your toast is cooked evenly every time. Whether you want a simple toaster or the creme de la creme of toasting technology, our range covers all the bases.